Maybe you're new to the world of furniture painting and have heard the hype but don't know what it's all about. 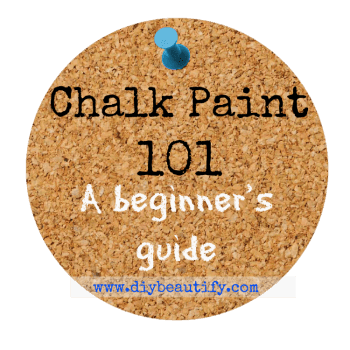 Well, here is a beginner's guide to the wonderful world of chalky paint! Disclaimer: I am not an expert. I am a do-it-yourself-er who has enjoyed dabbling in the world of chalky-type paint to transform furniture and other items in my home. Please be aware that the term "chalk paint" is exclusive to Annie Sloan products. 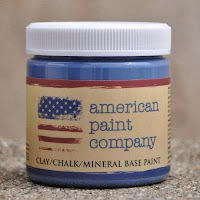 All other paints in this post are mineral-based paints but not true chalk paint! As well, this post does not cover every single chalky-type paint available on the market today! It is intended as a primer for the newbie! Don't miss Chalk Paint 201...an informative inside look at 10+ chalk paint brands...and my brand new post about budget Top Coat Options to protect your freshly painted furniture! Today's post explains the very basics of chalky paint for newbies...so let's get right to it! First of all, chalky paint is not the same as chalk board paint. Chalky type paint is primarily used for painting furniture, although it can also be used for many other surfaces. For today's 'lesson' we'll stick with furniture! Chalky paint has amazing adhesion qualities! What's wonderful about it is that it can be applied to pretty much any furniture in pretty much any condition... that means no prep! No sanding, no need to remove the shiny varnish. You still want to make sure you are starting with a clean surface (use a quality degreaser), but gone are the days of sanding down a piece prior to painting. Chalk painted pieces are easy to distress because the paint can be easily removed just where you want it (along the edges and where a piece would naturally wear) with a sanding sponge or sand paper. This type of distressing instantly ages even new furniture! Don't like the distressed look? Just don't distress! Chalky paint dries to a matte finish. Protecting the chalky coat with a furniture wax is not necessary and if not used, your piece will achieve a worn patina over time. Waxing will not give a high shine but a soft luster. Waxing is recommended, however, for pieces that are frequently used (especially the top of tables), as the wax protects the paint finish. Remember, my brand new post explaining top coat protection options for your painted furniture can be found here. Depending on the way you apply the paint, chalky painted pieces can look smooth and modern or crusty, chippy and old (even new pieces). Most companies that sell chalky paint also sell their own wax, which is applied either by brush or with a cloth. The wax is rubbed onto the surface and then buffed off and it basically seals the paint and provides a protective coating and hand-rubbed look. Very early-American. I didn't realize just how many companies there were now that make and sell chalky paint until I started to look. This is far from an exhaustive list but it is a list of some of the more well known companies today. I've included prices and links so hopefully this information is helpful to you if you are looking to buy. You will probably want to search for a stockist in your area first to save on shipping charges. 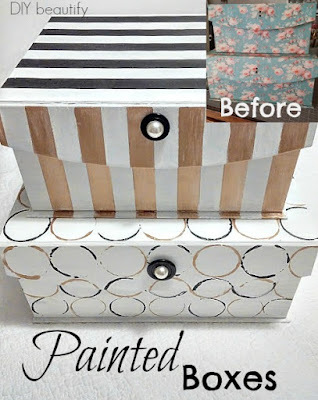 Annie Sloan was the front runner, as far as I know, to start the chalk paint craze. Her company, based in the UK, sells 30 custom colors that are historically accurate. 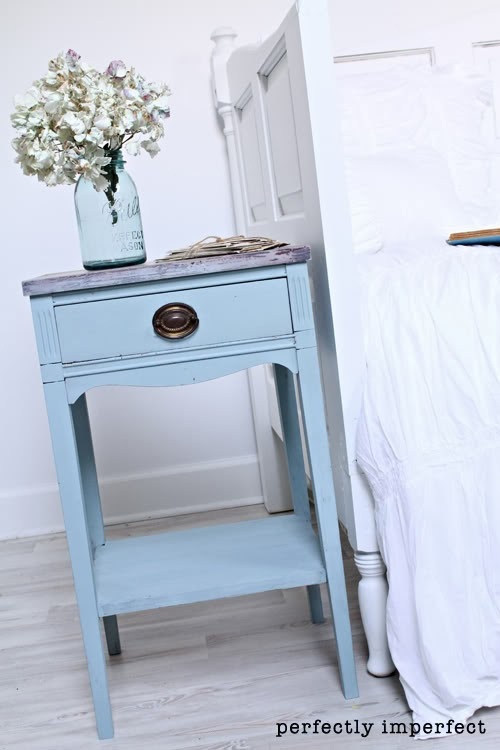 Duck Egg Blue, seen on the piece below, is one of the most popular colors. Sample pots (4 oz) are $11.95 and price per quart is about $38.95 so it's definitely the most expensive of the bunch. Vintage Market Furniture Paint is another chalk-based paint that has very good reviews. I read about it on a blog I follow, White Lace Cottage. They offer 4 sizes to choose from with their largest, the quart, being about $28.00 per quart. I didn't realize it but they have been around for about 40 years and have recently revamped their paint recipe. 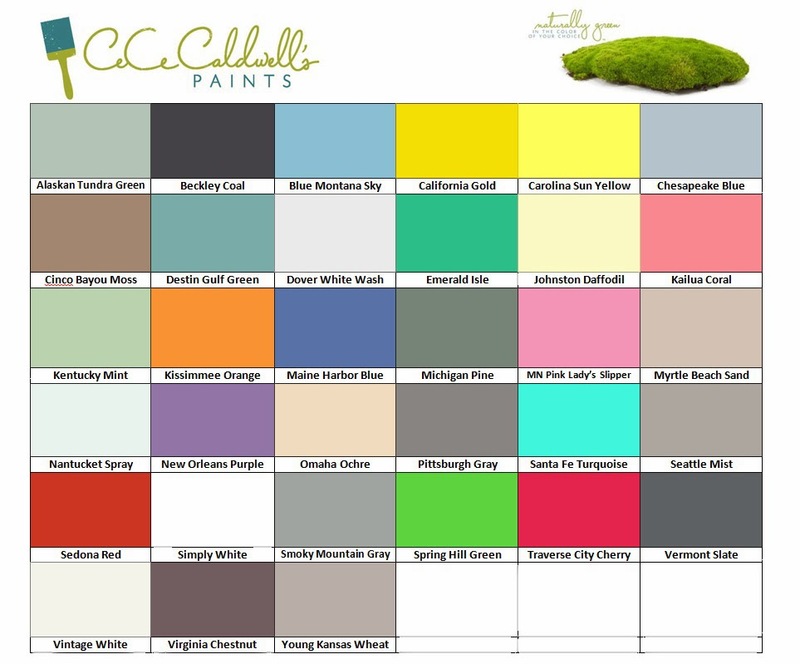 Another popular company that sells chalky paint is CeCe Caldwell's. Their company is founded on being safe and better for the environment. Their color palette is 'based on trends and traditions found in America'. 4 oz sample pots are $8.95 and quarts are $34.95. You may have heard of American Paint Company. Their chalky paint is 'all natural, zero VOC, eco friendly and solvent free'. Their colors have names like 'Blue Jeans', 'Born on the 4th', 'First Lady', 'Liberty' and 'Spacious Skies'. Their prices are $9.95 for a 4 oz sample pot and $34.95 for a quart. The last company I want to highlight is Websters Chalk Paint Powder. Their product comes in powder form and you mix it with flat latex paint of your choice. 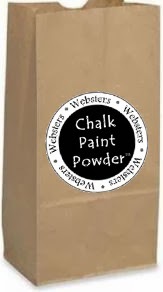 A 4 oz bag of Websters Chalk Paint Powder is enough for 1 quart of paint. At $13.95, it's by far the most economical of the bunch. Of course, you have the price of your paint to factor in as well. If you're really eager about saving money, the DIY option of mixing POP ( Plaster of Paris) with flat latex paint is definitely the way to go. Recipes abound on the internet and Pinterest...and this has been my choice for years as I cannot afford the pricier versions. Of course there are pros and cons to making your own chalky paint! The pro definitely being saving money and being able to custom mix your own colors! 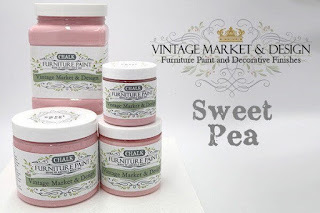 I wrote a post about making your own DIY chalky paint right in store sample paint pots. You can find that recipe here. I used the above recipe for years, but recently tweaked the recipe so it wasn't as lumpy. I'm sharing my updated diy chalk paint recipe here! The biggest con to making your own chalk paint is dealing with lumps. Even when you mix your powder in hot water, your paint will still be gritty. I've even tried sifting the POP and CC first, but the grit is just what happens when it encounters water. So how do I deal with the lumps from DIY chalky paint? There are a few things you can do to deal with gritty paint. I mix and mix and mix the POP, CC and HOT water together before adding it to my paint. The hot water helps to dissolve the powders, so make sure you aren't using cold or tepid water! Once adding the mixture to my flat paint, I mix and mix again. You cannot over-mix! While I'm painting, if I notice a piece of grit I wipe it away immediately with my finger (keep a damp paper towel handy). Once my furniture has dried, I go over the entire piece with a fine grit sanding sponge. This little sponge is my best friend when I am redoing furniture; I buy them in bulk! And this trick will completely transform your finished piece! It smooths the entire piece until it's soft as butter and flattens any little grits so they're not visible. So exactly how much chalk paint do I need for a piece of furniture? As a newbie to the world of chalky paint, you might be thinking, 4 oz?? 1 quart?? That's not going to be enough to do anything! You will be amazed at how far you can get with that much paint! To give you an example, I painted my first buffet and hutch (see it here) with a 4 oz sample size pot of paint (2 coats)...and I had leftover paint! Chalky paint goes a long way! And just because you've been such good students, I'll let you in on a little secret. Remember I told you how chalky paint has amazing adhesion? Yup well, you can pretty much paint anything with it, not just furniture! 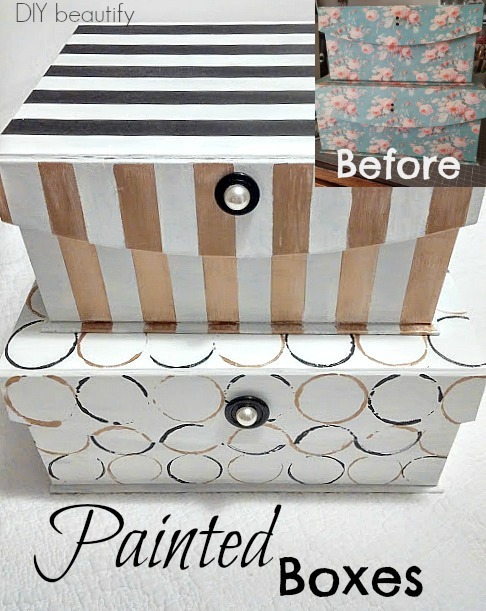 Check out these projects below that I transformed with chalky paint. 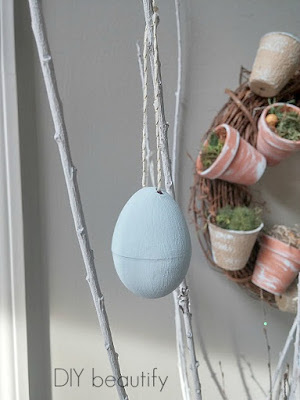 Paint Plastic Easter Eggs with Chalk Paint! I hope this post has been informative! There are lots of articles written about how to paint with chalky paint, how to wax, how to distress. This is really just a primer for the beginner, to introduce you to the product. If you have any specific questions, please feel free to contact me. I am by no means an expert, but I have painted many, many pieces of furniture....and other things (haha) so I do know a thing or two...or I will happily point you in the right direction. You can click on the links in the paragraph about each company to be taken directly to their site where you can read more about their particular brand. This is a great time to read Chalk Paint 201, an inside look at over 10 specific chalky paint brands, including lots of images and user reviews! Be an informed consumer before you go shopping for chalky paint! Pin this and refer back to it often! Thanks for the info and the list of choices. Can't wait to get started! Let's see which project first?? Toy Box, old school desks, kitchen island::: decisions, decisions! You're very welcome :) Glad to see you have options, lol! Just pick one and go for it! Great post! I I have been thinking about using chalk paint on an old coffee table to jazz it up a bit. I was at home depot the other day and saw they now have their own chalk paint as well, although there were only a few colors available. 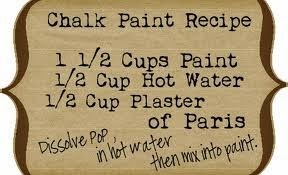 Thanks for giving some other great options for where to get chalk paint! Thanks for the great info! I had no idea there were that many brands to try! I've only ever used it once, but I'd like to give the homemade versions a try sometime. Thank you so much for this great guide! I have been wanting to get into chalk painting for over a year....there is a shop in the next town that carries the paint and gives lessons but it is ridiculously expensive!!! You are so welcome AnnMarie! There are numerous articles and great blog posts online that have helped me figure it out :) Good luck! I have used Annie Sloan and made my own. Sure do love it! Thanks for sharing with SYC. When mixing plaster of paris and paint...if i don't use all the paint how long will it keep? Well, after asking about pricing, I found your post here about several brands. Nice post, thanks. I have to give this a try - definitely starting with the mixing of my own using POP. Thanks again. Thank you for your comparisons!! I am a DIY girl and went straight to making chalk paint myself. I love it!! I find it very easy to do and very economical as well. Now I'm getting ready for a dining room set (GULP) and I want to stain the top and paint the base and chairs and use dark wax. I'll be honest, it scares the junk out of me!! Any experiences using dark wax, or tips??? Hey Sharon, although I certainly don't call myself an expert, I do have a lot of experience with DIY chalk paint and furniture. Always start with clear wax and work in small sections (like 6-8 inches or so). After applying the clear, Add some dark wax, with a different rag, rubbing it around to get the degree of depth you like. The coat of clear first means if you don't like it, no problem, just use a little more clear and wipe it off. Move on to the next section. You'll develop a rythym and once you get going it won't take long to complete your piece. Then go back and buff. Good luck!! Danita, I'm so glad you found the information useful! I appreciate you letting me know. Fyi, I'm planning to follow up this post with a more specific review of the chalk paints I've used and how I found them to work on my projects. I have satin latex paint that I was thinking about making into chalk paint. You mentioned using flat latex. Possible to use satin with the same results? Is Chalk paint good for table tops or writing desks? Is it hard enough to hold up? I am thinking about painting my dining room table, but I don't know if chalk paint will hold up. 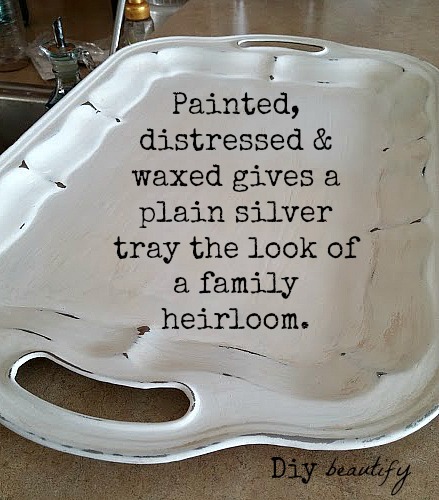 Chalk paint will dry like any other paint into a hard surface. Your table will need several coats of furniture wax or poly, which will cure to a hard, protective surface. So the answer is Yes! Hi Penny, welcome to my blog :) To be perfectly honest with you, I've never had to re-wax anything yet...I think it's only necessary if you're surface is getting a lot of use. The poly I like is a top coat by General Finishes that you brush on and let dry. It's water-based, so clean up with water is easy. Also, it's definitely stronger than wax, and I like that it comes in different finishes so your surface can be matte, satin or glossy. Unlike wax, there's no need to buff. Just brush on and let dry. (I'd recommend a couple light coats for a table top). Here's the link to the product so you can read more about it http://amzn.to/232F8rn (affiliate). I made some chalk paint using the plaster of paris method and painted my kitchen cabinets, loos great and so far holding up well, I did do a flat polycrilic afterwards. Hi, I want to start by painting a small night stand which is currently brown. I want it to have the old vintage look. Would I need to sand the old paint first and then chalk paint, or could I paint over it? And how would I achieve the old vintage look? I hope you see my response to this question! No sanding is necessary, but give your nightstand a good cleaning with a degreaser (I like Totally Awesome products). 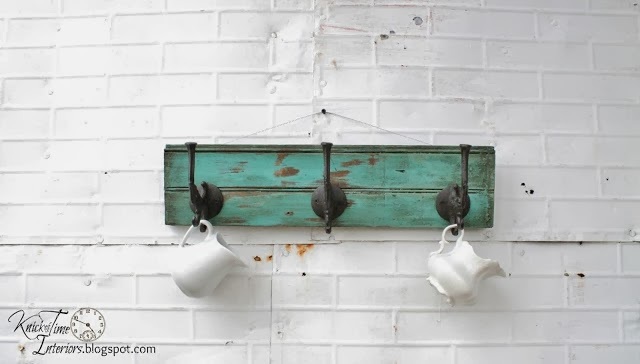 Once it's dry you'll need 2-3 coats of chalk paint. The second and third coats can be thinned slightly with water. You have two options for the vintage look: 1. don't cover the piece thoroughly with paint; leave some areas lighter or even bare wood to mimic natural wear or 2. after piece is dry, use a sanding sponge and sand the whole piece, paying special attention to edges and corners...you can even take it down to the bare wood in these spots (this is the method I use). Last, follow up with a furniture wax or matte poly. 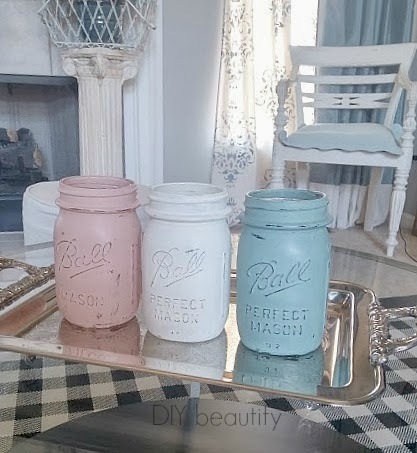 For more information on using chalk paint, check out this post http://www.diybeautify.com/2015/07/chalk-paint-user-experience-brand-reviews.html or search 'chalk paint' on my blog. Is the paint supposed to be gritty, when mixed? I used the grout with flat latex. That will happen if you don't dissolve the POP in warm water before adding it to the paint. You can try a sanding sponge to smooth it out. Great info and great answers. Do you know of one you would recommend that has a clean crisp white instead of the creamy worn look? I want to redo my bedroom suite and I want clean crisp white. Hi Marsha, I know that Annie Sloan makes a white that is bright and crisp. It's their Pure White. What a wealth of good information! Thank you so much! I've been saving pins RE Annie Sloan's chalk paint for months now, but haven't worked up the courage to try it yet. And now I find there's so many other choices. And I have tons of furniture around my house I want to refinish. My question today is, out of all the chalk paint companies that you're familiar with, which brand has the best selection of colors? That might be a personal preference, I guess, but the AS paint seems to have beautiful, soft colors, which is what I like, and I'm wondering if another less expensive brand might have similar colors. Thanks for all your help. I've decided to redo my breakfast room set. It is currently dark walnut. I did a rough sanding just to get the 'shiny' off. I'm leaving the horizontal surfaces in walnut and painting the rest white. I did one chair and found that it needed about 5 coats. I then brushed a clear wax over and buffed it. I'm concerned that it won't hold up to the grandkids so I'm considering doing the final step with Polyvine in a satin finish. I'm very nervous about this project. What are your thoughts as to durability of wax vs Polyvine and their pros and cons? Judy, from what I've read, you cannot successfully apply poly over a wax coat. It will not adhere properly and will just come off. You can however apply wax over a poly coat, to get the hand-rubbed look of the wax with the durability of the poly. I would probably do that with the rest of your pieces. For the piece that you waxed first, I would give it a couple more coats of wax over the next couple months...that should greatly increase the durability. Thank you for the information! I have a question that i hope you can help me with. I bought a small container of Amy Howard paint must to try it out on a piece of furniture before taking on a huge project of painting my kitchen cabinets. The small container of paint was wonderful, went on smoothly and evenly and took only 2 coats. That gave me courage so i purchased two quarts of AH in ballet white, i followed her directions before beginning, used her paint brushes to apply and i continue to see these tiny, hard, balls throughout the paint. I pick them off but it leaves a mark and looks terrible. Do you know what is causing this? I've tried using a purdy brush thinking maybe the brush was a problem, that didn't help, I've tried storing the paint more, that doesn't help either. Could there be something wrong with the paint or could it be from having it mixed? The small pre-mixed color didnt do this at all. I would love to hear your thoughts on this. I was so excited to take on this project and now I'm uncertain. Shelly, it definitely sounds like a problem with the paint. I would take it back and show them the graininess... hopefully they will exchange it for you! Hi! one question! I would like to paint my kitchen cabinets as well as the walls! This includes "regular" wall and tiles. Do you think I will be able with this recipe? And will it hold on? I cant find the colour I need in a ready one, so Im thinking in making it myself, as long as Im sure it will work!! Thank you very much in advance!